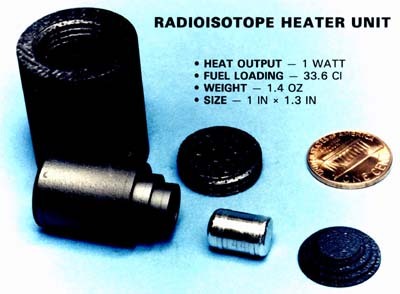 A radioisotope heater unit (RHU) is a device used to keep instruments warm aboard a spacecraft on a lunar or interplanetary mission. Most spacecraft can use solar energy to provide heat to keep their structure, systems, and instruments warm enough to operate effectively. However, when solar or other heat source technologies are not feasible, an alternate heat source is required for the spacecraft. By using RHUs, the spacecraft designer can allocate scarce spacecraft electrical power to operate the spacecraft systems and instruments. RHUs also provide the added benefit of reducing the potential for electromagnetic interference generated by electrical heating systems. Each RHU provides about one watt of heat, derived from the decay of a few grams of a radioactive substance, such as plutonium 238-dioxide, contained in a platinum-rhodium alloy cladding. Heat is transferred to spacecraft structures, systems, and instruments directly without moving parts or intervening electronic components. RHUs are very compact, 3.2 centimeters (1.3 inches) long and 2.6 centimeters (1 inch) in diameter. The fuel pellet is about the size and shape of a pencil eraser weighing approximately 2.7 grams (0.1 ounces). All together each RHU weighs about 40 grams (1.4 ounces). RHUs were used, for example, by the Apollo 11-17 (1969-72) missions, the Soviet Luna 17 (1970) and 21 (1973), and Galileo. Cassini and Huygens are equipped with 117 40-gram RHUs for temperature regulation.